Original early 1950's sideboard. Completely transformed with a salt-blasting process, and a black matt finish which smooth the grape and leaves sculpture of the walnut doors. Its black and white marble top is the original one, as well as all the hardware.1 drawer in the middle. Made in France. Sideboard of the 50's of 200cm of width on 56 cm of depth. Height of 112 cm. A French manufacture made in the 50s in Walnut. The structure and the interior of the piece of furniture are in blond wood covered with a very beautiful veneer color golden oak, finish glazed varnish. Large ancient Chinese Buffet from Shandong Province made of elm wood. Beautiful wood of beauty and extraordinary durability. Beautiful white furniture weathered with five doors. A beautiful pink powdery and aged white color for this ancient buffet from Gansu region in China.Wonderful drawings of peonies. A powerfull and impressive sideboard.Created by an Italian craftsman from the Piemont area in 1946.With cross-influences from the Baroque period and the Empire period, it also shows some oriental style: the legs are a pair of sculptured lions, with a mane looking like the hair of handsome Italian women.The top is a satin black glass. Very elegant black lacquered elm sideboard, from China in the Shanxi area and 120 years old. A very beautiful patina for this old buffet with many drawers. Double frontal doors. Very elegant buffet Pine blackened from China and 100 years old. A unique and authentic piece. Antique Chinese little sideboard from Gansu made ​​pine. Gansu is a province in northwestern China. Long narrow province , wedged between the Mongolian Plateau to the north and the foothills of the Tibetan plateau to the south. Impressive patterns and colors for this large and beautiful old buffet made entirely of poplar. A unique piece of a hundred years from the province of Gansu - China. Large width of 153cm by 45cm deep on a height of 90cm. Impressive black aged color for this large and beautiful old buffet made entirely of Elm. A unique piece of a hundred years from the province of Shanxi - China. Large width of 218cm by 45cm deep on a height of 94cm. Beautiful antique Chinese buffet lacquered and painted by hand.Provenance: Shanxi, China.Seniority: 100 years.Genuine authentic country furniture and Shanxi Province. Entirely made of solid pine, pine then lacquered. 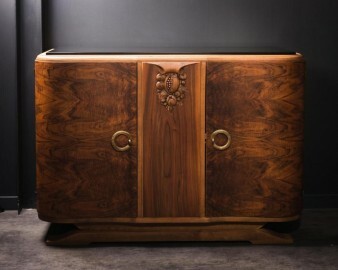 Antique Chinese sideboard from Lanzhou made ​​pine. Beautiful colors and patina left by the time for this sideboard with multiple shades. Floral designs backgrounds. Oxidized metal handles . Impressive motifs and colors for this large and magnificent old dresser made in pine. Large width of 225cm by 50cm of depth on a height of 70cm. This antique piece of furniture holds three large doors and a smaller one. A very beautiful piece of furniture, weather-resistant, with colors and vivifying drawings. Impressive patterns and colors for this large and beautiful old buffet made entirely of poplar. A unique piece of a hundred years from the province of Gansu - China. Large width of 262cm by 46cm deep on a height of 84cm. Very beautiful old buffet lacquered with a high gloss deep blue color. Provenance: Guanzhou, China. Seniority: 100 years. Hand-painted floral motifs. Beautiful colors. This furniture has been completely restored and renovated. Impeccable interior. Large and beautiful old buffet entirely made in Elm. A unique 120-year-old piece from Shanxi Province - China. Very Large Dimension: width of 280cm by 58cm deep on a height of 90cm. This antique furniture unusual has four doors and 5 drawers. A beautiful storage cabinet weathered by time. Art Deco Countryside Buffet 40s-50s. Art Deco Countryside Buffet 40s-50s. Original late 1940's sideboard. Completely transformed with a salt-blasting process, and a matt black finish which make it contemporary... Though it has been made in France more than 70 years ago. Its grey and white marble top is the original one. The brass harware is original, including those 2 rings highlighting the very simpleclean design of this piece. Vintage lacquered Chinese sideboard made in elm, black. A unique old piece made in traditional style. Pretty several doors of several dimensions. Delivery by private carrier by appointment. Of great beauty, exquisite furniture with veruy original colors seldom seen.